How to Install Alexa Toolbar Extension in Browsers? Find an easy way to download the Alexa toolbar extensions for Chrome, Internet Explorer and Firefox. The link will direct you straight to the Alexa.com website where you can download the Alexa Toolbar Extension safely. 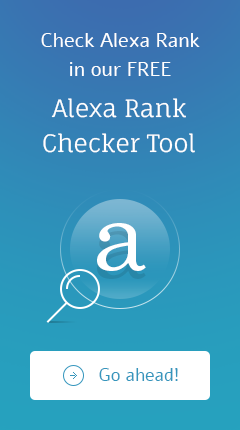 The Official Alexa Traffic Rank Extension, providing Alexa Traffic Rank and site Information when clicked. Alexa Traffic Rank is an Alexa Internet’s free extension for Chrome, and is the only extension that includes you in Alexa’s traffic panel. The Alexa extension accompanies you as you surf, providing you with Alexa data about the sites you visit without interrupting your browsing. Get quick and easy access to a site’s Alexa Traffic Rank and sites linking in. Thank you for your excellent work and determination in getting the perfect results with our website. We’ve come a long way ~ languishing for a long time in the 6 figure ranking to where we are today! This is no small achievement. Kudos to you!